Sure, it’s sweet and salty and has its share of fat – all the usual markers Americans use to measure a satisfying dish – but it’s also very flavorful, attractive, and easy to make. It helps that the condiments used to season it are tasty and used in relatively small quantities. No mayonnaise or chop suey noodles appear, or cool whip and marshmallows – leftovers of the 1950s that still appear regularly in some potlucks I’ve attended. I’m naming the recipe here for my brother, who always asks for this recipe before any others. The photo is from a dinner several years ago when I made this for my Grandmother’s birthday during a visit. The chicken came out great, the birthday cake less so – it looked like fried chicken when it was supposed to be chocolate angelfood. But that’s a story for another day – this chicken has never given me any trouble. Combine flour, salt, and cayenne powder in a large resealable plastic bag; add chicken pieces a few at a time and shake to coat. You can make extra batches of the flour mixture if it doesn’t go far enough. Grease a 13×9″ pan and add chicken, then spray chicken as well if you’re using spray oil. Bake, uncovered, at 350° for 30 minutes. 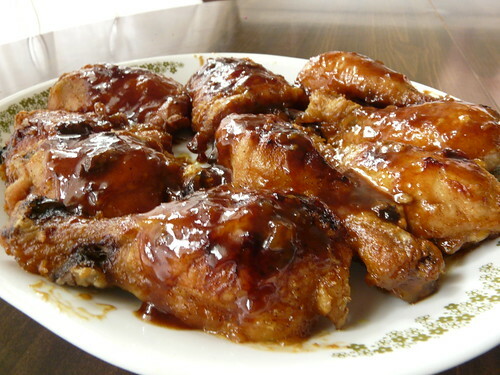 Combine brown sugar, honey, lemon juice, soy sauce, curry powder and melted butter; pour over chicken. Bake 45 minutes more or until chicken is tender, basting several times with pan drippings. Note: The basting is the trickiest part – I recommend a very shallow ladle, if you happen to have such a thing. Or pull it all out of the oven and carefully tip it to one corner to collect the juices, then spoon them over the chicken. I have yet to find an actual baster that works for me.